"I enjoyed seeing these items. Know nothing about sea cucumbers??? we are planning a family trip at the beginning of August to St. George Island. Should we keep our plans? 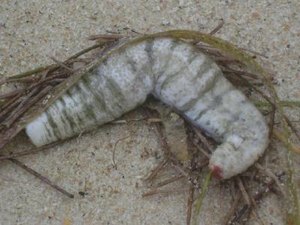 Actually the main thing I know about sea cucumbers is that they are a common sight on the beach just after a storm like this, and they gradually get re-absorbed and buried in the sand again in a few days. The beaches are open and we are back full-force - the island is gearing up for a great 4th of July week already! Our weather has been nice compared to our neighbors to the north - high today was only around 86. Can't promise the same for August - typically our hottest month! But, yes, your plans for St. George in August should be good to go!